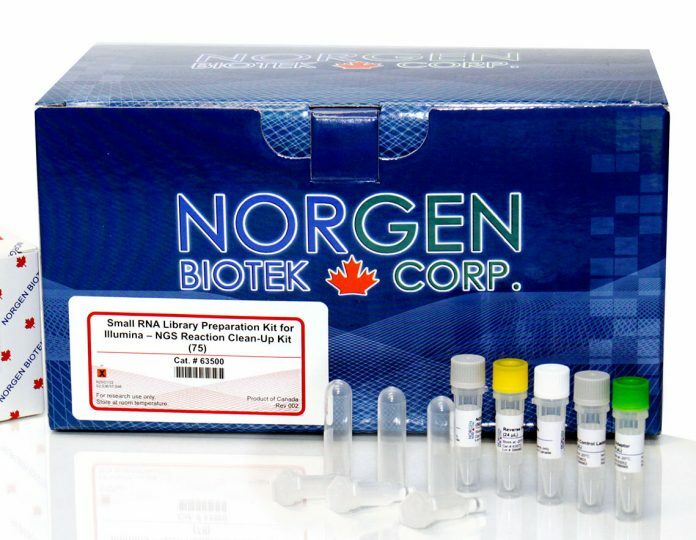 Canadian nucleic acid and protein purification company Norgen has launched the new Small RNA Library Prep Kit. The kit consists of all the reagents and components required to generate small RNA libraries to be used for next-generation sequencing on an Illumina platform. The kit has been optimized for low input RNA (0.5–1ng), especially from bodily fluids and liquid biopsy samples such as plasma, serum, blood, cerebral spinal fluid (CSF), urine, and exosomes. The simple and rapid workflow allows for the library to be prepared in less than 5 hours, with no gel purification required for selected types of samples. Norgen has also launched complementary products for Small RNA Library construction including NGS-compatible cel-miR-39 spike-in as well as the NGS Library Quantification Kit (for Small RNA-Seq).